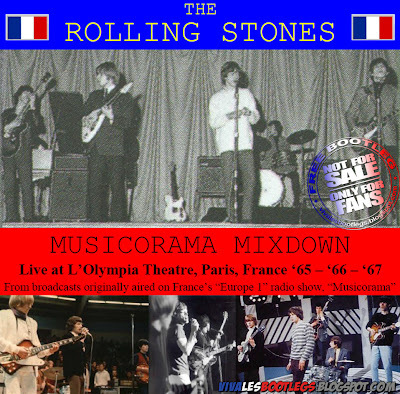 Recorded Live at L'Olympia, Paris, France - 1966, 1967, 1968. Excellent FM Broadcasts :: CDR/s :: Lossless FLAC. Files: 46. :: Size: 737 MB (flac). Personnel: Brian Jones :: Mick Jagger :: Keith Richards :: Charlie Watts :: Bill Wyman. Notes: The original Rolling Stones lineup with Brian Jones has very few available concert recordings. Many radio and TV recordings survive but they aren't true concerts, just a few songs at a time. Fortunately for Stones fans, French radio recorded and broadcast four concerts in Paris from 1965 to 1967. The tapes have been rebroadcast several times over the years and been released on a number of bootlegs. 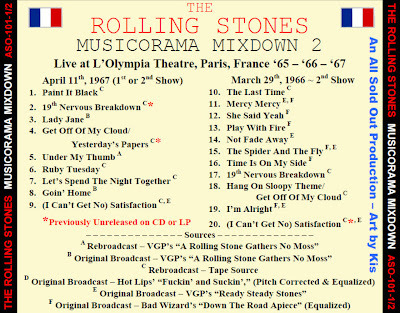 All tracks were recorded at L'Olympia, Paris, France by French radio. This compilation is my attempt to combine the best source for each song for each concert. Previous bootlegs simply used one broadcast or rebroadcast. You had the choice of listening to a complete concert in fair to good quality, or a few songs in excellent quality. Now, 3 out of the 4 concerts are 3 or 4 source merges; the 4th is a single source. I made this compilation in Nov. 2004 and no longer have the files, so these are extracted from the CDRs I made at the time. Most of the material is sourced from trade CDRs; source D is sourced from a silver pressed CD, all extracted at the time using EAC. Source C is from a low gen. cassette into my PC using a Turtle Beach Santa Cruz sound card. I am told that the most recent rebroadcast was on French radio, July 1, 1995, in honor of the upcoming show at L'Olympia July 3, 1995. 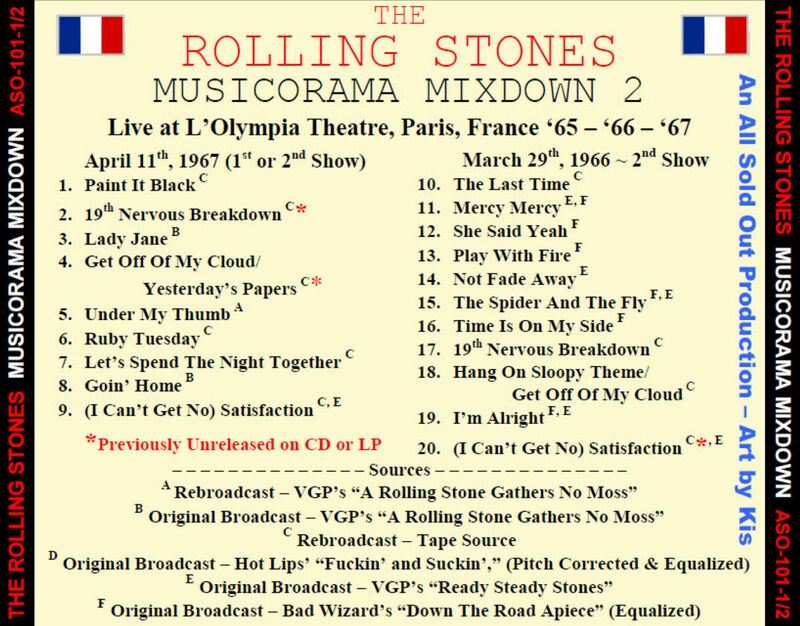 I am not sure if this is source A or C. I believe that this torrent is the source for DAC-007, "Paris Match," but have not heard it for comparison. 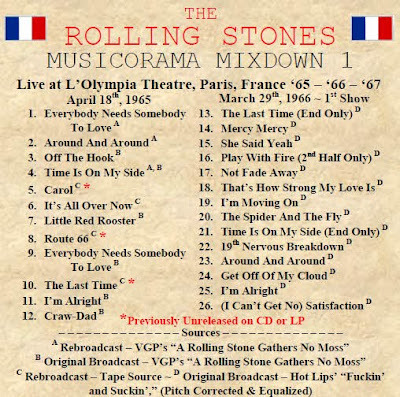 I named this compilation "Musicorama Mixdown" after the name of the French radio program and the process of mixing down multiple sources into one final product. Enjoy, there are some rare songs and great performances here. <-(Info taken from original info file). Another great boot from this fantastic site! Thank you very much for all the goodies!! You should receive thousands of thanks everyday for every post you do like this!! I can highly HIGHLY recommend this collection. Most of it is high quality (the exception is the March 29, '66 second show) and the '67 is especially rare and wonderful.